Recent Study Reports a Link Between Food Allergy & Autism, Or Does It? A Cautionary Tale. If you have been in our office, or in the office of any doctor worth his/her salt, recently you have probably heard the term “evidence-based medicine”. I could (and may) write an entire post about what goes into “evidence-based medicine”, but the short version is that the information we use to help us make healthcare decisions is not based on experience or feelings, but is instead based on the cold hard facts found in medical research. But, even the medical literature has to sometimes be taken with a grain of salt. Case in point, a recent article in the open access version* of the Journal of the American Medical Association has been making some major waves on social media and in other media outlets. This study, by researchers at a large Midwestern univeristy, reports a significant association between common allergic conditions (like food allergy) and autism spectrum disorder (ASD). This means that parents of kids with ASD report more allergies than parents of kids without ASD. Wow! That’s groundbreaking stuff, right? Well, maybe not. There are two major problems with this type of study. The study relied on a self-reported diagnosis of a condition. This is always a slippery slope. Allergy in particular is significantly overreported in these types of situations. For instance, a significant portion of the population will report they have “spring and fall pollen allergies” yet allergy testing shows that the actual number of people that have evidence of allergies on testing is far smaller than the number who report allergies. People with lactose intolerance may say they have a milk allergy (they don’t). People who gain weight when they eat a lot of bread may say they have a wheat allergy (they don’t). So relying on self-reported diagnosis of a condition can often misinterpret the true number of people who have that condition (in fairness, the authors do acknowledge that this is a weakness of this study). 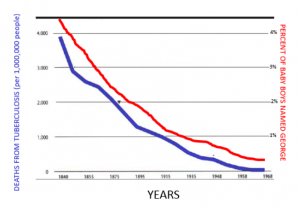 So I could easily say based off of this graph that as less people name their babies George, fewer people die of tuberculosis. Does that mean that having the name George increases the chances someone will die of tuberculosis? Of course not! Deaths from tuberculosis declined because of better diagnostic techniques, increased availability of healthcare, medications that kill the causative agent etc. People stopped naming their baby boys George for, well, whatever reason. But just because they decreased simultaneously (association) does not mean that in any way that one caused the other (causation)! So to recap, just because parents of children with autism spectrum disorder report that their children have more allergies does not in any way indicate that food allergies or other allergies contribute to the development of autism. We don’t know if these self-reported allergies are proven or just something that the parent believes the child has. There are so many other variables that can explain the association, but there is absolutely nothing based on this study that proves causation. The moral of the story is that just because something is in the medical literature does not mean it doesn’t have to be scrutinized. There is nothing dishonest or improper about this study, but the findings should be taken for what they are: parents of children with autism say that their kids have more allergies that parents of kids that don’t have autism. This is sadly also the type of story that the mainstream media and especially fringe pseudoscientific publications latch onto. So when you see the headline on the article that your friend shares with you on Facebook – just because they cite an official sounding journal article, be careful of accepting conclusions drawn on data that absolutely doesn’t support those conclusions. *A sidenote on open access journals: an open access journal is one that anyone can read without a subscription. Most of the major medical journals (New England Journal of Medicine, etc.) pay for the cost associated with publication by requiring their readers to pay a subscription fee. Open access journals typically require either the author or the author’s institution to pay a fee for their paper to be included and this covers the costs associated with publications. There can be good research in these types of journals, but this practice is often criticized in the scientific community because of the appearance that the authors “bought their way in” to the literature instead of getting their work published on its own scientific merit.